That’s the answer freshman volleyball player Carrie Rutledge gave when asked how she’s able to deliver scorching spikes at opponents. Hyperbole? Maybe. But the Rochester Community and Technical College outside hitter is the Minnesota College Athletic Conference (MCAC) southern division player of the year. She hits the ball quite hard. Rutledge was number two in the MCAC in kills per set this season, and ranked eighth nationally. The Yellowjackets went unbeaten (12-0) in conference play, so it makes sense that many players came away with awards. Rutledge and freshman setter Brekkin McCready were both first team all-southern division and first team all-state. McCready was first in the MCAC and the nation in assists per set. Second team honors went to middle hitter Mariah Steinbach and freshman libero Katlyn Bade. You can read more about their stats here. And finally, RCTC head coach Amber Zitzow was named southern division coach of the year. In addition to going undefeated in the conference, the team only lost one set out of 37, and is ranked third in the nation. The volleyball team last won the national tournament in 2015. The Yellowjackets play in the national tournament Thursday at home at 6 p.m. in the Rochester Regional Sports Center. They face off against the winner of Rock Valley and Harrisburg Area. 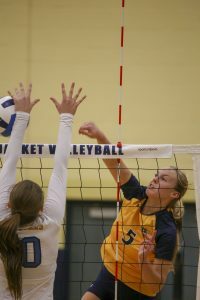 Read all about what drove the Yellowjacket volleyball team this season.